Select from our wide range of connectors to get your water filter systems running effectively! Available in Compression style or Quick connect style, our fittings and plumbing parts are designed to fit all types of filtration systems for both residential and commercial use. Compression fittings require a nut to secure the tubing to the connector. While the quick connect fittings have tubing's inserted directly into the tubing. For assistance, please contact our experts. Style 1: Compression Fittings Compression fittings are also known as JACO style fittings, JEAK style fittings, and Parker FAST AND TITE fittings. 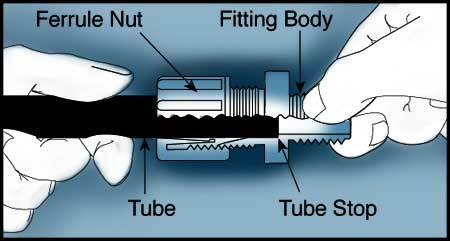 The diagram below illustrates how the compression fittings are used. Quick connect fittings are also known as John Quest fittings, TiteGrip fittings, Tite Grip fittings, GA Murdock Mur-Lok fittings, Murlok fittings, Anderson Barrows fittings, Speedfit fittings. See details below about how to install quick connect fittings.